OSHA Updates GHS Labeling of Hazardous Chemicals. Learn More. By June 1st, 2015, all hazardous chemical containers and packaging being shipped in the U.S and abroad are required to be labeled with element information, pictograms, hazard and precautionary statements. This article is designed to help chemical processors, manufacturers and distributors understand the necessary changes to their chemical labeling processes. 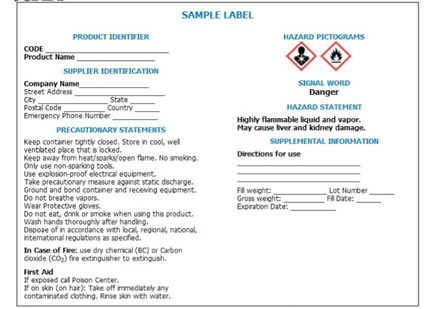 Also, to help manufacturers identify what information needs to be present on the label, proper use of pictograms as well as hazard and precautionary statements that must accompany the chemical classification pictogram. Though regulation does not take effect until June of 2015, chemical manufacturers, distributors and processors are being encouraged to start labeling their products, under the new ruling, as soon as possible. In order to identify labels under the HCS, manufacturers , distributors and processors must first identify and classify the chemical hazard(s); to do this, see Appendix A, B and C of the Chemicals Hazard Communication Standard. The classification criteria for health hazards are in Appendix A, the physical hazards in Appendix B. After classifying the hazardous chemicals, see Appendix C to determine the appropriate pictogram(s) for the chemical label. Now it is time to design your label. The following bullet points are required to be on your GHS labels by June of 2015. OSHA states that any chemical manufacturer, distributor or processor who becomes aware of these guideline prior to 2015, must begin practice of the new system immediately. Name, Address and phone number of the manufacturer or responsible party. Product Identifier. This is how hazardous chemicals are identified. This may be, but is not limited to, the chemical name, code and code or batch number. The product identifier is at the discretion of the manufacturer, distributor or processor and must be the same for both the label and in section 1 of the SDS. Signal Words which are used to indicate the level of severity of the hazard and alert the reader to the potential dangers of the chemical. This will be one of two words, either “Danger” or “Warning”. The word danger is used for severe chemicals and Warning for less severe. Only one signal word may be used on the label, no exceptions. Hazard Statements describe the nature of the chemical(s) including degree of hazard. For example “Causes damage to retina’s after short periods of exposure.” All of the applicable hazard statements or risks must be listed on the label. These statements are specific to the hazard classification categories of a specific chemical. Precautionary Statements describe the measures that should be taken to minimize or prevent adverse effects of exposure to the chemical through improper storage or handling. There are four types of precautionary statements they are; prevention (to minimize exposure), response (in case of spillage or exposure), storage and disposal. An example of a precautionary statement would be “Do not breathe fumes.” In the event the chemical is inhaled, get medical attention immediately. Dispose of contents in container in accordance with local regulations. A forward slash indicates the classifier can choose one of the precautionary statements. Precautionary statements may be combined in an attempt to save space on a label. Ex: Do not breathe/ingest/swallow chemicals. Lastly, a manufacturer can eliminate a precautionary statement if they can prove the statement is inappropriate. Supplemental information lists any additional information that may be helpful to a consumer as well as any materials not currently classified. This section must also identify the percentage of ingredient(s) of acute toxicity when it is present in a concentration in excess of 1% of the mixture as a whole. There is no required format for how supplemental information must be listed on the label. The GHS uses a total of nine pictograms, however they only enforce eight. An environmental pictogram is the exception. It is important to note that the nine diamond shapes used in GHS labeling do not replace or pardon the use of DOT (Department of Transportation) labels used in transporting chemical totes tanks and containers. For a full list of GHS pictograms, click here. All labels must be legible, written in English, and prominently displayed. Other languages may also be displayed in addition to English. All employers are responsible for maintaining the label on containers, totes, tanks or drums. The labels must be kept legible and be easily identifiable. Employers are not responsible for labels once the chemical has been shipped. OSHA has not made any changes to workplace labeling. Employers have the option to create their own workplace labels. Please see Hazcom 1994 directives for instructions on workplace labeling. ImageTek Labels is ready to help you meet these new GHS requirements quickly and easily, by offering a variety of labels in various shapes and sizes to meet your packaging requirements. Please visit www.imagetekdigitallabels.com to purchase a roll of custom, chemical RoHS labels. Simply choose your size and fill in the chemical hazard information that can be obtained through Appendix A, B and C of your Hazard Communication Standards.